MK note (10 Oct 2004): This photo of George Philipson (#58) was sent to me by Owen "Reg" Kitchener (#41), his old comrade. 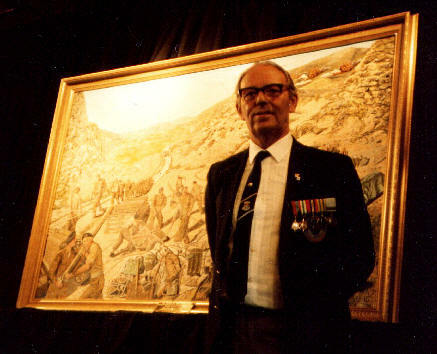 Reg told me that, in this photo, is George in front of the painting of C. Troop, 170 Imjin Independent Mortar Battery, Royal Artillery at the Battle of the Imjin in April 1951. Thanks much, Reg, for coming up with this photo and sending it to us.